Hawks Stones (as seen from Kebs Road, near Todmorden). 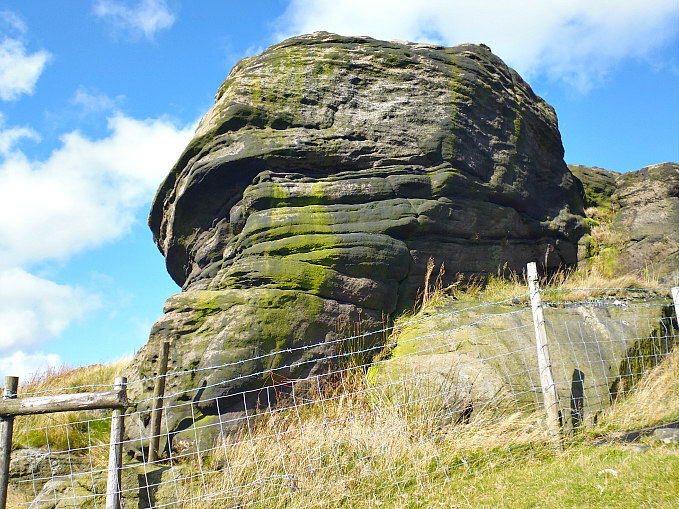 Hawks Stones, near Todmorden (strange shaped rocks). OS grid reference: SD 9233 2735. 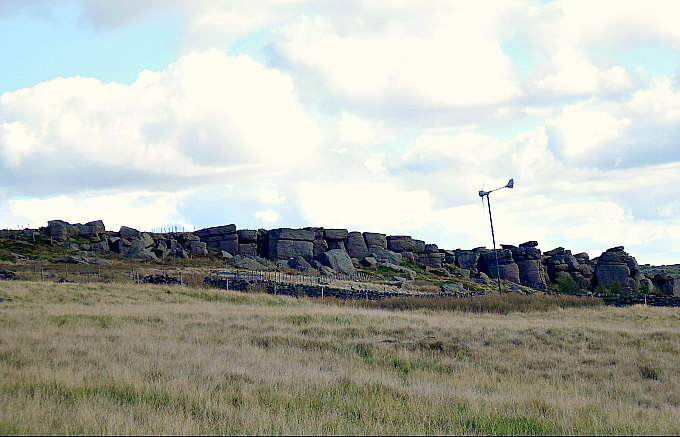 A gritstone outcrop at the western edge of Stansfield Moor above Kebs Road, near Todmorden, in west Yorkshire. 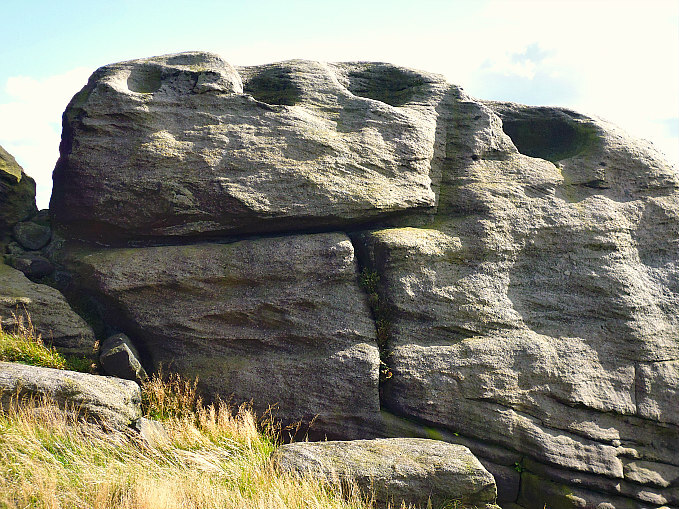 Like its near neighbour, Bride Stones, Hawks or Hawk Stones has many strange-shaped weather worn rocks and boulders that were first laid-down many millions of years ago, and then fashioned by a retreating glacier during the last Ice Age – some 13,000 to 15,000 years ago. 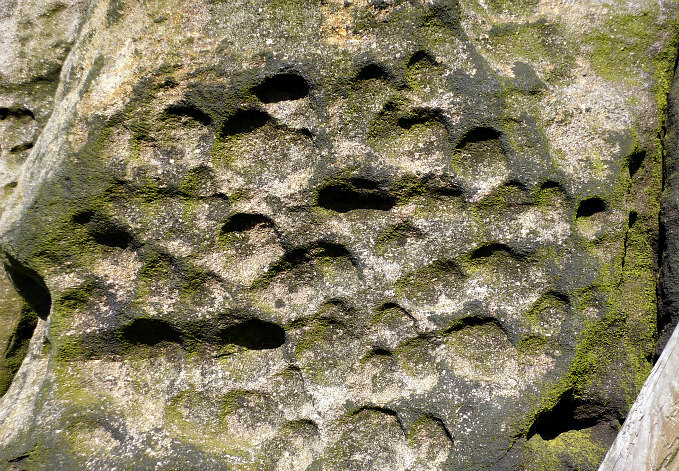 There are the usual naturally-formed rock basins, and a few of the larger boulders appear to have ancient cup-marks, although it is often hard to differentiate between erosion-related holes and man-made rock-art. To reach Hawks Stones take the footpath from Kebs Road going east up the slope near the “old” Sportsman public house, then after 60m follow the ridge – going north-north-east to where you will soon reach the gritstone outcrop. However, the farmer has put up a lot of barbed-wire fencing, which makes it difficult, if impossible, to access some parts of the site. 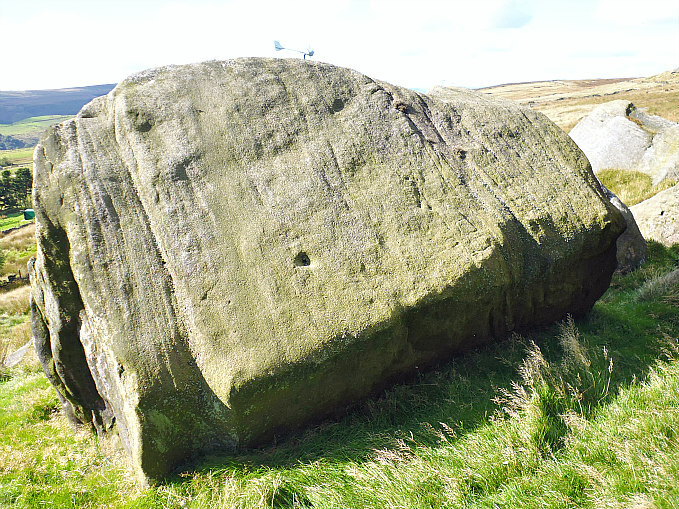 Possible cup-marked rock at Hawks Stones, near Todmorden. 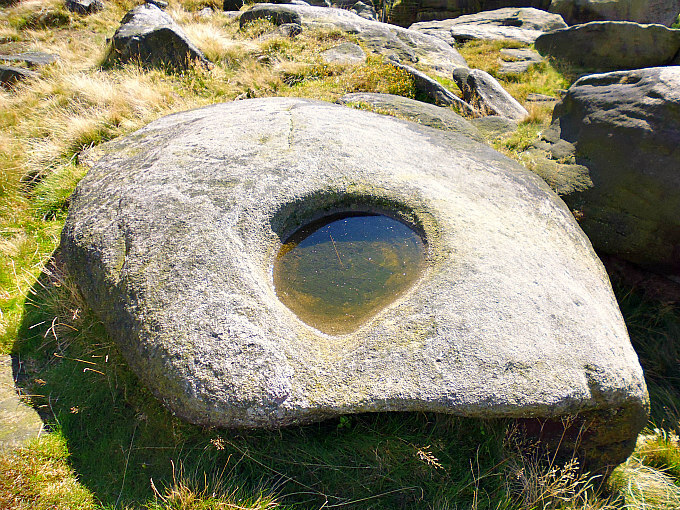 Rock basin at Hawks Stones, near Todmorden, west Yorkshire. Hawks or Hawk Stones over to the east of Todmorden is an outcrop of millstone grit rocks and boulders that have taken on the form of some strange and odd shapes over many thousands of years; the erosion caused by weathering has added to the general eerie look of the place, which has, perhaps, been associated with the druids and their ritual and sacrificial worship back in the mists of time. The many rock pools and basins that are worn into the rocks maybe adding to that strange, mysterious feeling that one gets when visiting these lonely, moorland places. Some of the larger rocks and boulders look to have “possible” prehistoric cup-marks, some being more pronounced, while others are much more fainter. Or could these have been made by weather-related erosion over thousands of years? The place-name Hawks or Hawk Stones is thought ‘not’ to be associated with, or named after, the bird of prey! Hawks Stones (naturally formed rock basins). Hawks Stones (cup-marks, or something else). Bennett, Paul, The Old Stones of Elmet, Capall Bann Publishing, Milverton, Somerset, 2001. Boswell, Geoff, There and Back, Delta G, Todmorden, 2000. Categories: Cup-Marked Rocks, Natural Rock Formation | Tags: Hawks Stones on Stansfield Moor near Todmorden in West Yorkshire | Permalink.